Unknown: You gotta be crazy to listen to the audio commentary, period. David X. Cohen: You can give away what's going to happen in the episode, just don't give away what's going to happen in the audio commentary. Bill Odenkirk: On hiatus, on hiatus. Matt Groening: Please, I'm living in denial, and I wanna remain so. David: Ah, The Curiosity Company. Bill Odenkirk: They make cars don't they? David received a phone call from his assistant. At 07:00 a.m., Leela has finished guarding the box for the night. The sun is shown rising... in the west-southwest. 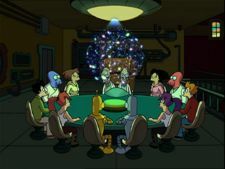 Professor A (our universe's Professor Farnsworth) addresses his Universe 1's counterpart (with the stitched-up head) as "Professor B" rather than "Professor 1". This page was last edited on 31 May 2018, at 19:46.